John Axford signs with Oakland A's for 2016 Season! <?xml:namespace prefix = v ns = "urn:schemas-microsoft-com:vml" /><?xml:namespace prefix = o ns = "urn:schemas-microsoft-com:office:office" /><?xml:namespace prefix = w ns = "urn:schemas-microsoft-com:office:word" />St. Marys - The Tip O'Neill Award will be awarded to the Milwaukee Brewers ace closer John Axford from Port Dover, Ontario and the Cincinnati Reds slugging first baseman Joey Votto from Etobicoke, Ontario during the week of April 23rd. The award will be presented to Axford and Votto in pre-game ceremonies in each of their home stadiums. Axford's award will be presented on Tuesday, April 24th in Milwaukee and Votto's award will be presented on Thursday, April 26th in Cincinnati. The Tip O'Neill Award is presented annually by the Canadian Baseball Hall of Fame to the player judged to have excelled in individual achievement and team contribution while adhering to baseballs highest ideals. Axford led the Milwaukee Brewers to the playoffs with a National League leading 46 saves. He was awarded the 2011 National League Rolaids Relief Man Award. The 65, 195-pounders single season save total ranks third in Canadian history, trailing only Eric Gagné, who saved 55 games in 2003 and 52 in 2002. The hard-throwing right-hander compiled a 1.95 ERA with 86 strikeouts, 25 walks, and 59 hits over 73 innings. He converted 46 of 48 save opportunities. In six playoff appearances, Axford had a win, three saves, struck out nine in seven innings, and landed a 1.29 ERA. 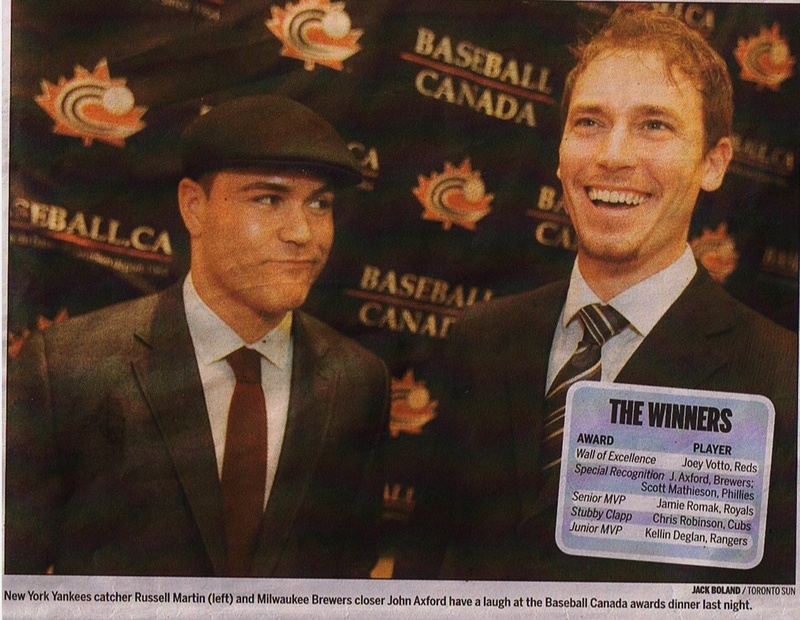 This is sweet, really an honour!, exclaimed Axford from his home in Ancaster, Ontario. Votto was a National League All-Star and Gold Glove winner who finished sixth in MVP voting. The 2010 National League MVP and Lou Marsh Award winner batted .309 and had 29 home runs, 72 extra base hits, and a Canadian record 110 bases on balls. The Cincinnati Reds marquee player led the National League in batting average on the road (.334) as well as batting average with runners in scoring position (.383), and led all MLB first basemen in games (160) and innings played, total chances, putouts, assists and was second in double plays. The left-handed slugger had 185 hits including a National League-leading 40 doubles, 103 RBI, scored 101 runs, and stole eight bases. He also amassed a slugging percentage of .531, an on-base percentage of .416, and a .947 OPS (9th best in the National League). Its an honour to win a share of this award and be mentioned alongside such great Canadian baseball players as Larry Walker, Jason Bay, Justin Morneau, Eric Gagné, and John Axford, said Votto from his Florida home. This is the third time in the award's history that it is being bestowed upon two recipients. The Canadian Baseball Hall of Fame's Director of Operations, Scott Crawford, states: "Based on the tremendous seasons both players had, it would have been unfair to choose one player over another. They both deserve the award for the excellence they displayed individually and for the significant contributions they both made to their respective teams. This is the correct result and I'm delighted to be presenting the award to two extremely deserving players." The award is named after Woodstock, Ontario native James 'Tip' O'Neill, one of Major League baseball's first legitimate stars. With the St. Louis Browns in 1887, O'Neill amassed staggering statistics: .492 average, SLG-.691, Hits-225, Doubles-52, Triples-19, Homeruns-14, Total Bases-357, Runs-167 (4th all-time for a single season), RBI-123. The outfielder set major league records in hits, doubles, slugging percentage, and total bases that season while compiling his astounding .492 batting average. Bases on balls were included as hits in 1887, but if O'Neill's average was calculated by today's standard, it was .435, the second highest in major league history to Hugh Duffy (.438). Fireballing senior hoping for return to action after missing all of '04 season while recovering from "Tommy John" reconstructive elbow surgery (Dec., 2003) ... showed tremendous attitude and work ethic during rehabilitation ... expected to make full recovery for '05 season ... will have the option of applying for a fifth year of eligibility in '06 ... tireless worker who leads by example and is expected to be key veteran for '05 staff ... made big strides in his delivery and throwing from a more controlled arm-slot during limited '04 fall and winter workouts ... hoping to follow success stories of recent ND pitchers Danny Tamayo and Grant Johnson, who both returned from injury with a high level of production and success ... Tamayo missed sophomore season in '99 (elbow) before returning in '00 and then having a 1st team all-BIG EAST season in '01 (when he was a 10th-round draft pick of the Kansas City Royals) ... Johnson also missed his sophomore season ('03; shoulder surgery) and was eased back into action during impressive '04 season (1st team all-BIG EAST) before signing with Chicago Cubs as 2nd-round pick ... rated by Baseball America/Perfect Game as No. 145 draft-eligible college prospect for '05 season ... BA's season preview for the '05 season listed him as the BIG EAST's No. 6 overall prospect (4th among draft-eligible players), behind St. John's closer Craig Hansen, Pittsburgh 2B Jim Negrych ('06 draft-eligible), ND sophomore RHP Jeff Manship ('06), St. John's RHP Anthony Varvaro and Rutgers OF Johnny Defendis ... two ND juniors - OF Craig Cooper (60th) and closer Ryan Doherty (90th) - also were on the Sept. '04 PG/BA prospect list (they were not included on BA preview list of league's top-10 prospects) ... made some major progress in mechanics and command during '03 fall workouts, prior to injury ... known for electric set of pitches, with a fastball that has pushed into high-90s and hard-breaking curveball ... has classic pitcher's body (6-6, 190 pounds) ... compiled strong freshman season (3.95 ERA, 5-2 record, 64 strikeouts in 70.2 innings) that was overshadowed by huge postseason wins from his classmates Johnson and Chris Niesel - before starting 9-0 in '03 ... able to induce timely double-play groundballs ... opted to join Notre Dame program, despite being selected by Seattle Mariners in 7th round of '01 Major League draft ... projectable pitcher whose talent ceiling played large part in high draft status ... first two seasons with the Irish included 4.13 ERA and 14-5 record in 31 appearance (25 starts, 133 Ks, 109 walks, 122 hits, .238 opp. batting, 21 wild pitches, 11 hit batters in 141.2 IP) ... one of five Notre Dame '02 freshmen invited to play in prestigious Cape Cod League ... had challenging '02 summer with Hyannis Mets (7.17, 0-3, 12 GP/2 GS, SV, 21.1 IP, 21 H, 30 BB, 25 Ks) but went on to be rated by BA as No. 29 prospect in '03 CCL ... trained with Canadian National Team in summer of '03 before joining CCL's Cotuit Kettleers (1-0, 9.00, 7 GP, 9 IP, 4 H, 16 BB, 8 Ks) ... winning pitcher for Gold in decisive third game (3-2) of '01 Blue-Gold fall intrasquad series (5 IP, 2 R, 5 H, BB, 2 WP, 5 Ks) ... 17th Notre Dame pitcher ever to post 12-plus Ks in a game (12, vs. Western Michigan in '03) and 4th to do so since 1980, joining Darin Schmalz (`96) and current Major Leaguers Brad Lidge (`98) and Aaron Heilman (three times, '00-'01) - with Niesel and Tom Thornton adding 12-K games in '04 ... joined fellow RHP Tyler Jones as ND's two signees in '01 spring period ... latest in string of talented "late signees" for the Irish, with that group including pitchers Lidge and Tim Kalita and position players Jeff Wagner and Brant Ust ... made up for lack of varsity baseball at his high school by playing with Port Dover club, Team Ontario and Team Canada ... gained valuable experience playing throughout Canada, the U.S. and Dominican Republic ... third player from outside the 50 states (second Ontario native) among 800-plus all-time ND baseball monogram winners ... 2B and Ottawa native Robert Hoag lettered with the '39 Irish team while CF Joseph Ridge (Margarita, Canal Zone) lettered from '51-'53 ... posted 3.28 GPA in '04 spring semester (3.20 in fall of `04). AS A JUNIOR: Missed entire 2004 season after undergoing reconstructive elbow surgery in December of 2003. AS A SOPHOMORE: Turned in impressive start to 2003 season, posting 9-0 record and 2.21 ERA before late struggles ... tied Niesel for team lead in victories (9-3), 2nd in strikeouts (69) and games started (13), 3rd in innings (71.0) ... slipped to 4.31 final ERA (50 BB, 63 H, .245 opp. batting, 14 WP, 5 HB in 15 GP) ... his average of 8.75 Ks per 9 IP ranked 2nd on staff ... tied Niesel for team lead with 26 Ks "looking" ... ranked 4th on staff for lowest opp. batting with runners on (.238) while his average of 8.0 hits allowed per 9 IP was 5th-best ... opened with win over Newman, at ASU (6 IP, 8 H, 2 R, 2 BB, K; 15-5) ... followed with strong no-decision vs. Wake Forest at Minnesota Metrodome (7 IP, 4 H, R, 2 BB, 4 Ks, 2 DPs; 2-1 in 13) ... posted wins in Jacksonville over Navy (5 IP, 6 H, 3 R/2 ER, BB, 7 Ks; 7-3) and Creighton (6 IP, 5 H, 2 R, 2 BB, 8 Ks; 10-3) ... continued string of eight straight winning starts at Villanova (5 IP, 2 H, R, 4 BB, 7 Ks; 3-2) and at home vs. Georgetown (6 IP, 3 H, 2 R/1 ER, 5 BB, 8 Ks; 13-3) ... set Eck Stadium record for strikeouts by an ND pitcher, punching out 12 Western Michigan batters in 12-1 win (7 IP, R, 6 H, 104 pitches) ... kept rolling with home wins over Central Michigan (7 IP, 5 H, 2 R, 5 BB, 4 Ks; 8-3), Seton Hall (6 IP, 3 H, 2 R, 5 BB, 2 Ks; 9-3) and UConn (6 IP, 4 H, R, 6 BB, 6 Ks; 11-4), before losses to potent West Virginia squad and other top BIG EAST squads Virginia Tech and Rutgers ... pitched in relief at BIG EAST Tournament, vs. Rutgers (2.1 IP, 5 H, 5 R/4 ER, 7 BB, 3 Ks; 11-15). AS A FRESHMAN: Rode rollercoaster 2002 season that ended with 3.95 ERA and 5-2 record in 17 appearances ... five of 12 starts came as No. 1 starter of a tournament or series ... totaled 64 Ks (third on staff) in 70.2 innings (59 BB, 59 H, 7 WP, 6 HB) ... held opponents to .231 batting, best among Irish pitchers with 25-plus innings ... touched for just one home run (324 batters) ... served up 18 double-play balls (most on staff), with 1.53 ratio of groundouts to flyouts (second-best) ... averaged 8.15 Ks and allowed just 7.01 hits (second-best on staff) per 9 IP ... made first appearance in relief at New Orleans (4 IP, 3 H, 2 R, 6 BB, K; 7-8) ... had six Ks to beat Creighton in first start, as all-tournament pick at Irish Baseball Classic in San Antonio (6-2; 7 IP, 4 H, 2 UER) ... racked up 9 Ks to win 12-3 game at Georgetown (6 IP, 4 H, 1 ER, 3 BB) ... added another BIG EAST win vs. St. John's (6.1 IP, 3 H, R, 6 BB, 5 Ks; 4-1), followed by no-decision vs. Pittsburgh (5 IP, 4 H, 1 ER, 2 BB, 6 Ks; 12-2) and 9-4 win at Seton Hall (7.2 IP, 6 H, 4 R, 6 BB, 7 Ks) ...overcame 5 walks, 3 hit batters and poor defense (3 UER) for solid start vs. Arizona State (4.2 IP, 4 H, 1 ER, 4 Ks; 9-4) ... picked up key 8-1 win over Villanova (4.2 IP, 3 H, R, 7 BB, K) ...logged 3.0 innings as starter in decisive 3-2 win over Rutgers at BIG EAST Tournament (3 H, 2 R, 3 BB, 3 Ks) ... had impressive 4.2-inning stint to keep Irish in game during 12-5 loss at Florida State in game-2 of NCAA Super Regional (3 H, R, 4 BB, 5 Ks) ... FSU's famous fan section, "The Animals," unknowingly serenaded him with their customary rendition of "Oh, Canada" in 7th inning ... pitched in season-ending 5-3 loss to Stanford at College World Series (1.1 IP, 2 BB, K). PREP & PERSONAL: One of Canada's top prospects while playing for club and national teams (Assumption College Prep does not sponsor baseball) ... ranked by BA and Toronto Star as Canada's top prep prospect for '01 Major League draft, before being selected in 7th round by Seattle Mariners ... his four-year career stats with Port Dover, Team Ontario and Team Canada: 37-12, 1.88 ERA in 278 IP (432 Ks, 173 BB; 14 Ks, 5.6 BB per 9 IP; 2.5 K-to-BB ratio) ... combined '01 stats: 11-2, 1.31, 124 Ks, 42 BB in 75.6 IP ... went 10-1 in '00 with Port Dover Midgets and Team Ontario (1.46, 68 IP, 118 Ks, 45 BB) ... posted 10-3 combined record and 1.24 ERA in '99 with Port Dover and Team Ontario Jr.'s (65 IP, 101 Ks, 46 BB) ... split 12 decisions with Port Dover Bantams in '98 (3.52, 69 IP, 89 Ks, 40 BB) ... invited to Team Canada Spring Training ('01) ... member of '01 Team Canada Youth Team ... posted save with Team Canada ('01) at Disney Sports Center in Orlando, for games vs. pro rookie-level teams ... won decision vs. Team USA during summer of '01 (Joplin, Mo.) ... competed in Dominican Republic vs. teams from Dominican Summer League, posting 1-1 record ... member of Team Ontario 18 that placed 5th at '01 NABF World Series ... played on 2000 Team Ontario squad that claimed bronze at Canadian National Championships and silver at NABF World Series ... closing pitcher for Team Ontario in wins that clinched '99 and '00 Provincial Championships ... participated in Chicago White Sox Area Code tryouts ... invited to 2000 Team One Showcase (at ND) ... helped lead Port Dover to three Provincial titles ... member of 2000 Port Dover team that was named "Team of the Year" by Baseball Ontario ... four-time all-star at Southern Counties All-Star Game ... Port Dover's '98 minor player of the year ... participated in high school volleyball, badminton and track and field ... set school high jump record as a junior ... played hockey for 12 years as a defenseman (until sophomore year) ... honor student and member of student government cabinet ... born April 1, 1983, in Simcoe, Ontario ... son of Brian and Vera Axford ... full name is John Berton Axford ... a film, television and theatre major, enrolled in the College of Arts and Letters. Okay, I’ll admit it. The title of this post is a bit of a misnomer. With Buster Posey & Jason Heyward playing out of their heads, Canadian John Axford has no chance at winning the 2010 Rookie of the Year award. But if he were in the American League? It might be a different story. 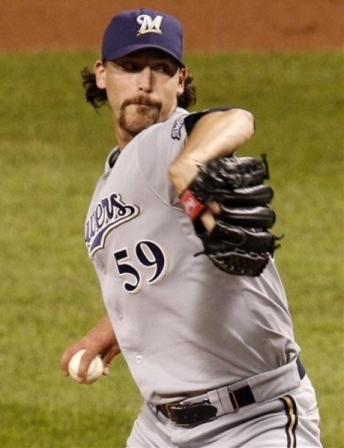 Since taking over the Milwaukee Brewers closer’s role from the faltering Trevor Hoffman, the mustachioed 6’5″ 195lbs. Axford has racked up 20 saves. Axford is somewhat of an unknown to most baseball fans. Where did this guy come from? Like many overnight successes, there is a back-story of a lot of hard work involved. Axford first showed up on the Canadian baseball radar when he pitched for Team Ontario. A prized high school pitching prospect, he impressed scouts by being able to throw a 96mph fastball with hard breaking stuff. He parlayed his success into a scholarship at Notre Dame where he pitched for 3 years, despite being drafted by the Seattle Mariners in 2001. RHP John Axford flashed first-round potential in the Cape Cod League in 2003, but had Tommy John surgery that December. He has been slow to come back, missing all of 2004 and working just three innings this spring. He had a low-90s fastball and a plus curveball before he got hurt, though his command was sporadic. Because he’s a redshirt junior, a team could take him as a draft-and-follow. As a result of his scholarship not being renewed, Axford transferred to New York state’s Canisius College, a popular school for Canadian collegiate ballplayers. That season Axford was 3 -8 with a 5.01 earned run average in 14 starts. Axford walked 75 and struck out 75 in 70 innings. That summer he pitched in the Western Baseball League, an independent Canadian circuit. That same year Axford signed with the Brantford Red Sox of the Intercounty Baseball League (IBL), an independent league based in Ontario. Although he struggled in his only start for Brantford (4IP, 5BB, 7H, 5ER, 1HR, 6K) he managed to open the eyes of some scouts, including the Milwaukee Brewers. Axford struck out plenty of hitters in the Western Baseball League, enough so that the New York Yankees were impressed enough with his peripheral numbers to sign him as a free agent late in the 2006 season. The Yankees intended to use him to fill out the depth chart on their minor league rosters. After seeing Axford pitch live in a game, Yankees minor league director Pat Roessler said to him “you keep spotting your fastball the way you’re doing and you’ll be a big leaguer.” Unfortunately for John, he was unable to spot the fastball. Across all levels he pitched in in the Yankees organization, Axford put up a walk rate of 6.4 BB per 9 innings pitched. The only other 2 pitchers in all of baseball to have a walk rate that high were Dontrelle Willis and Oliver Perez. Axford was subsequently released. Following the season Axford continued to work out indoors while bartending at East Side Mario’s in Dundas, Ontario. Those same Brewers scouts who watched him play in Brantford were tipped off to his indoor workouts. Brewers scout Jay Lapp then arranged a private workout at The Baseball Zone in Mississauga. “It was surprising that he’d been released,” said Lapp, who recommended the right-hander to Brewers’ assistant-GM Gord Ash following the workout. Ash invited Axford to the Brewers’ spring training facility in Arizona to get a closer look at him. He was signed in march of 2008 and assigned to Brevard County of the high-A Florida State League. 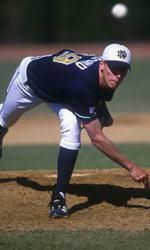 Axford struggled in 2008 as the control problems that plagued him at Canisius showed up again. Axford was 5-10 with a 4.55 ERA walking 73 and striking out 89 in 95 innings. Things weren’t looking good for a 25 year old failed prospect stuck in the Florida State League. However, in 2009 things Axford got the magic back. Coming out of spring training, the Brewers decided Axford was best suited to a relief role and assigned up to Brevard County again to repeat the level. The Brewers tinkered with a few mechanical flaws in Axford’s delivery and his walk rate dropped. Axford hit the ground running in a breakout year. He raced through 3 minor league levels on his way to a September callup with Milwaukee. His walk rate? A career-low 3.1 per 9IP. He made his big league debut on September 15th at Wrigley Field vs. the Cubs in the 8th inning. Combining his numbers at single-A Brevard, AA Huntsville and AAA Nashville, Axford went 9-1 in relief with a 2.43 ERA. He got his control back; Axford walked 38 and struck out 89 in 68 1/3 innings. With Milwaukee he posted a 3.52 ERA and held opposing hitters to a .179 BAA in 7 relief appearances. The cherry on top was inducing an Albert Pujols pop-up in the bottom of the 10th inning on the final day of the 2009 season. “Bring that with you next spring,” said Brewers manager Ken Macha. And bring it with him he did. Axford showed up in Peoria in spring training throwing smoke, striking out 7 and walking only 2. Although he didn’t make the opening day roster, Axford pitched well at AAA Nashville, striking out 19 while walking only 5 in 13 innings. His mid 90′s fastball was back with a mid 80′s slider and 80 mph curve. With legendary closer Trevor Hoffman struggling to begin the season, going 5 for 10 in save opportunities with a 12.21 ERA, Axford was given the closer’s role temporarily to allow Hoffman to take a breather. 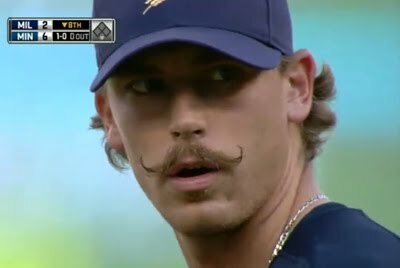 Axford has gained significant notoriety with his reliability in closing out games, not to mention significant popularity with the ladies for his magical mustache. 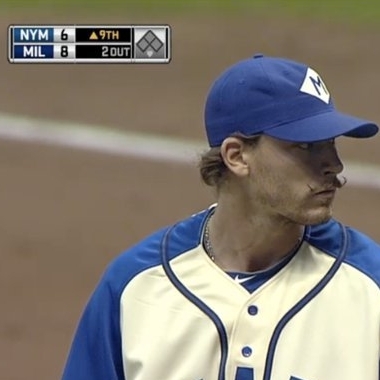 In fact, Axford’s mustache has its own Facebook page. The mustache can also be found on Twitter. Its bio states: “The talk of Milwaukee…Best ride in town. A real ladies’ stache.” Sad to say that the mustache is no more – Axford was only growing it until he got to see his wife, Nicole, who he hadn’t seen since spring training. It has now morphed into a goatee. Axford hass given up only 1 HR in 55 major league innings and walked 27. It just goes to show that if you strike out enough guys and keep the ball in the yard, you can get away with a few extra walks. Axford’s career path has been anything but conventional, and if he does succeed in a high-leverage role, it certainly wouldn’t be the first time that a reliever emerges out of relative obscurity. This is another story that serves as incentive to keep perservering through life’s obstacles and to never give up on your dream. Milwaukee manager Ken Macha seems to be approaching the Trevor Hoffman(notes) situation in exactly the same way that lame duck politicians approach large, intractable problems. He's leaving the mess for the next guy. Macha isn't quite willing to elevate John Axford(notes) (pictured) to the full-time closer's role, nor is he willing to fire Hoffman. Instead, he's apparently just waiting to be fired himself. "I'm not eliminating Trevor," said Macha, referring to all-time saves leader Trevor Hoffman. "I want to give [Hoffman] a few more innings. But it's going to be nice if we have coverage like that." "There's no problem having a couple [options]," Macha said. "My last year in Oakland, we had six guys with saves. I'd like to get Trevor back. ¡­ The more guys you're can bring in pressure situations and they're able to get outs, that makes your bullpen that much stronger." And then he added something nice about LaTroy Hawkins(notes), which I refuse to republish because ¡­ well, c'mon. He's LaTroy. 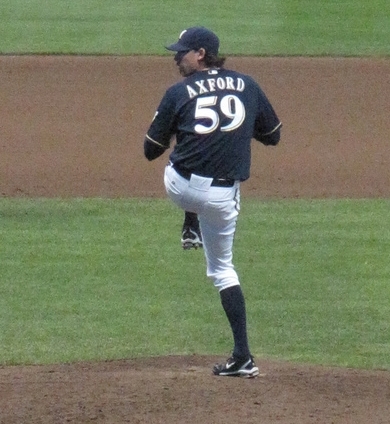 Axford has been outstanding since he was called up from Triple-A Nashville on May 15. 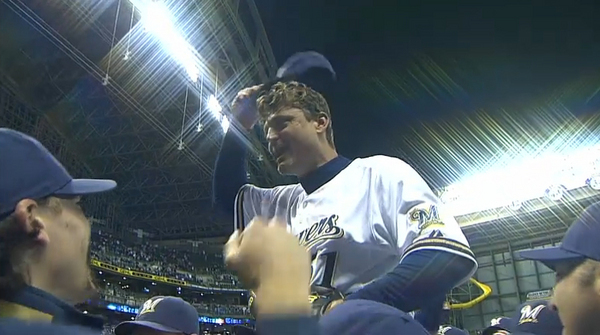 In five of his seven appearances for the Brewers, he's pitched a full inning without allowing a hit. He's allowed just two runs over eight innings and he's struck out 13 batters. As Macha recently told the Milwaukee Journal Sentinel, "He certainly has the stuff, there's no doubt about that." "Hoffman had a nice inning [on Sunday]," Macha said, "and it looked like his command was pretty good today. That was a positive." The 42-year-old Hoffman pitched in a non-save situation for the third straight game and recorded his third straight scoreless outing. "He pitched one game in the Minnesota series and one game in the Houston series," Macha said. "I closely scrutinized both those outings. The one in Minnesota he was putting the ball right on the corners; that's how he pitched last year. "The one against Houston (on Wednesday), pretty much every ball was right down the middle. It would be nice to have him back doing what he did last year." words of encouragement and congratulations for every player. Ball. I remember playing in Port Dover Minor Baseball all the way back to Rookie Ball. was heartbreaking. But despite those loses and despite the disappointment I kept playing. celebrated right there on the field. It was the best baseball moment of my life. went through so much over the years to try and get to that moment and we finally did it. a trophy self in my house. It is one the best baseballs that I have. including surgery on my elbow, but I never gave in or gave up. what the dream is. Life is going to be hard but the harder you work the easier it will be. these moments are only possible because of Port Dover Minor Baseball. Keep working hard, keep playing hard, and good luck. to Port Dover Composite School to give support to the community. His sporting achievements speak for themselves but are over-shadowed by his kindness, generosity and genuine nature. Nothing was too much for John who not only thrilled visitors with his willingness to talk, pose for photographs and sign autographs but also an impromptu ball session with three rookie players. Donations were accepted throughout the afternoon which was matched by John, instantly doubling the donations received on the day. This day will not be forgotten neither will the man that Port Dover is proud to call their son - John Axford.